Why Be Curious? ‘B’ may be in honor of Francesco Guccione’s Bisnonno (great grandfather), it may be for Blend, or it may Be for another ‘B’ word that Francesco hasn’t yet told us. In any case, it’s a blend of two noble Sicilian red varieties: Perricone (native to northwest Sicilia) and Nerello Mascalese (native to the slopes of Mount Etna, but also found in the northwestern part of the island). It’s spicy and complex, with a little of that warm Scirocco wind from northern Africa. Produttore / Producer: Francesco Guccione is a grower in the vinously nearly-forgotten northwest of Sicilia who has made a name for himself by re-discovering this corner of the island and its potential. His wines are crisscrossed with character and intrigue; they bring to life a land whose stories span from the ancient Phoenicians to modern Sicilians. Vigna / Vineyard: The locale is called Cerasa, and it lies 35 kilometers southwest of Palermo. Cerasa has always been famous for the quality of its grapes; back in the days when negociants did most of the bottling, buyers arrived from all over Sicilia to select their grapes. The Guccione vineyards have been certified organic since 1996 and farmed biodynamically since 2005. Francesco adheres to a strict natural regime: massale selection of vines, dry farming, and various cover crops including herbs like chamomile and echinacea. Cantina / Cellar: Fermentation in 3000-liter tini (large, upright wooden casks) with native yeasts. A year of aging, also in tini, and no filtering or clarification. Il Vino / The Wine: Perricone gives dark red fruits with the hint of bitter cherry that characterizes many of Italy’s best and most distinctive red wines. (Recent research suggests a parent-offspring relationship between Perricone and Sangiovese.) Nerello Mascalese adds perfume and elegance. Think of it as the pan-Sicilian red. A Tavola… / At the Table… Red meat and stronger white meat dishes, especially game and braised meats. Aged cheeses. 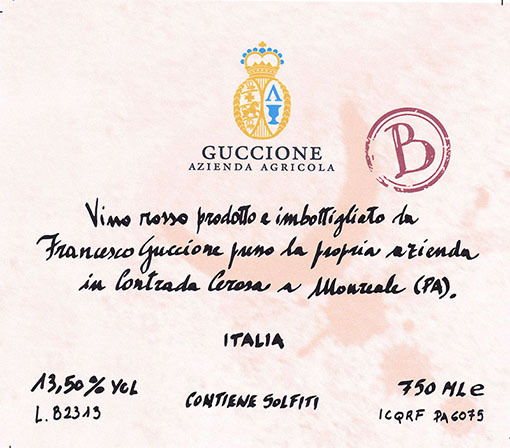 Denominazione / Appellation: IGT Sicilia (within the Monreale DOC). Quota / Altitude: 480 m / 1575 ft.
Suoli / Type of soils: Marl with medium clay content. Esposizione / Exposure: East and west. Vitigni / Varieties: Perricone and Nerello Mascalese (approximately 50%-50%, but varies by vintage). Età delle viti / Vine age: Nine years old (planted in 2005). Densità / Planting Density: 4400 vines/hectare. Allevamento / Trellis system: Spalliera (vertical trellis). Data di vendemmia / Harvest date: End of September to mid-October. Metodo agricolo / Agricultural technique: Certified organic and practicing biodynamic. Resa / Yield: 5000-6000 kilograms / hectare. Fermentazione alcolica / Alcoholic fermentation: Spontaneous, in 3000-liter tini (large, upright wooden casks). Fermentazione malolattica / Malolactic fermentation: Yes, also in tini. Affinamento / Élevage: One year in tini and additional months in bottle. Produzione annua / Annual production: 2000 bottles, in cases of 6 bottles each. Gradazione alcolica / Alcoholic %: 13.5%. Tappo e bottiglia / Closure and bottle: Natural Sicilian cork, 750 ml Burgundy bottle, finished with natural Sicilian beeswax.